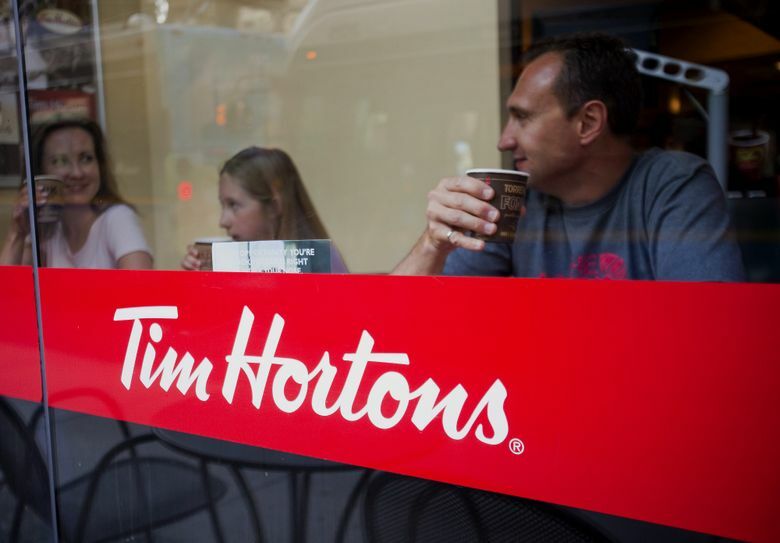 Tim Hortons, a cult favorite in its Canadian homeland, is making a bigger push into the U.S., where Starbucks and Dunkin’ Donuts are tough rivals. Tim Hortons, a cult favorite in its Canadian homeland, is making a bigger push into the U.S., betting it can win over Americans addicted to Frappuccinos and Dunkin’ Donuts. The coffee chain — whose same-store sales jumped 5.8 percent in the U.S. last quarter — is opening new locations in places like Indianapolis, Cincinnati and Columbus, Ohio, adding to its roughly 650 outposts. Eventually the U.S. could have “a whole lot of them,” said Daniel Schwartz, CEO of parent company Restaurant Brands International. On a same-store-sales basis, the coffee chain is growing about twice as quickly as Restaurant Brands’ other major division, Burger King. That business saw North American growth of 2.8 percent last quarter by that measure. But moving south of the border won’t be easy. Starbucks and Dunkin’ Brands Group have largely cornered the U.S. coffee market, locking in millions of customers with loyalty programs and convenient locations. The chain, known to millions of Canadians simply as “Tims,” also has stumbled in previous attempts to expand in the U.S. It closed 27 shops in New York and Maine in the fourth quarter because of poor performance. In Canada, Tims is an institution. Hockey legend Tim Horton, who played for the NHL’s Toronto Maple Leafs, opened his first restaurant in Hamilton, Ontario, in 1964 — back when doughnuts and coffee were 10 cents each. By 1967, the brand had begun franchising and adding locations. The company is seen as the “hometown hero,” said Bill Chidley, partner at brand consulting firm ChangeUp in Dayton, Ohio. Since the 1984 debut of its first U.S. store in Tonawanda, N.Y., the chain has had fits and starts. In the 1990s, Wendy’s bought Tim Hortons and tried to make it work in the U.S.
Wendy’s later spun off the chain after facing pressure from shareholders such as Bill Ackman. Tims, which held an initial public offering in 2006, made other attempts to curry favor with Americans, including co-branded shops with Cold Stone Creamery. It then was acquired by Florida-based Burger King in 2014, part of a deal that the burger chain used to form a new parent company with a Canadian headquarters. The $11 billion transaction, backed by Warren Buffett’s Berkshire Hathaway, created Restaurant Brands International, which is based in Tim Hortons’ longtime home base of Oakville, Ontario. Restaurant Brands is controlled by billionaire Jorge Paulo Lemann’s 3G Capital, which previously teamed up with Buffett to take H.J. Heinz private and has a famous zeal for cost cutting. Since the takeover, Tims has eliminated jobs at regional offices and corporate headquarters. In making a bigger play for Americans, Tims is eyeing the growing share of budgets that go toward java. Coffee-shop sales growth is outpacing that of burger joints, according to data from research firm Technomic. The U.S. also is the world’s largest coffee-consuming country. The coffee chain is touting its coffee and food items, such as Nutella-filled pastries and savory items like new grilled wraps, to attract U.S. customers. But with so many options at Starbucks, Dunkin’ Donuts and regional coffee chains, it’s going to be hard to stand out, Chidley said. Krispy Kreme Doughnuts also is stepping up efforts to improve its restaurants and compete with Starbucks. Creative menu items aren’t going to make up for Americans’ lack of a connection to Tim Hortons, Chidley said.